Peter Brannen is a science writer. His work has appeared in newspapers and magazines. He writes about discoveries and professors and interesting and fun things. So why has his book given me nightmares? The Ends of the World is not a futuristic “aliens attack” novel. Nor is it an apocalyptic war/genocide vision. This is not about a prospective “how the world will end” scenario–at least, not entirely. This is a well written, thoughtful, clear look at how the world has ended. How life has been scrubbed from our planet. How the tenuous hold of biology has been torn away from Earth before. And this has happened not once, not twice, but five previous times in our planet’s history. And some argue we are in the midst of the sixth. 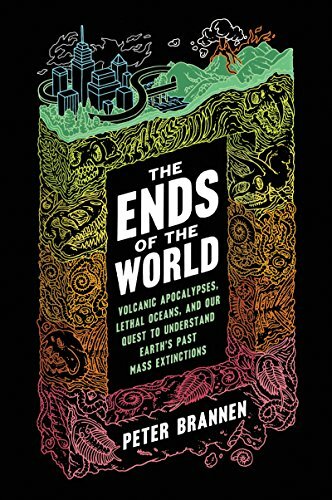 Brannen’s The Ends of the World covers the history of life–focusing specifically on the history of death. Not just any ordinary deaths, either. Five times our planet has faced mass extinction events that have had worldwide effect. Once, the result was a rounding error away from 100% fatality of every species of animal AND plant alive. The most well-known of these events resulted in the extinction of the dinosaurs, but the four previous events were just as cataclysmic and possibly even more comprehensive in their life-ending totality. The Ends of the World goes around the world in search of clues to these abrupt breaks in the story of life on Earth. Six chapters are specifically named after these interruptions: “The End-Ordovician Mass Extinction,” “The End-Devonian Mass Extinction,” and following the same titular pattern he looks at the Permian, Triassic, and Cretaceous extinctions. Each of these ancient eras had an abundance of life, though much of it would be strange to us. Trilobites and ammonites and giant fish and salamanders the size of cars and, of course, dinosaurs. In their time, they walked or swam the world as its masters. Many times the world they inhabited was very different from our own: warmer, more carbon dioxide, a single massive continent instead of the global distribution of land we currently have. And the length of time they had on the planet was also significantly longer than we appreciate. Humans have been around for only 2 million years or so. Global distribution of our species goes back maybe 30,000 years, and civilization less than 10,000 years. Some of the earth’s previous masters were dominant for tens or even hundreds of millions of years. Yet all of them eventually faced a crisis which ended their course. Only hubris would say we are immune to the same fate. As a species we have trouble agreeing on what to have for dinner any given night, so it should come as no shock that scientists differ on the causes and reasons for previous mass extinctions that happened long before humanity was a twinkle in evolution’s eye. Even the one which has the most hard evidence to support it, the impact of a six-mile wide asteroid in what is now Mexico, is not universally believed to be the cause of the End-Cretaceous extinction; although most agree that an asteroid hit at the same general time as the mass extinction with catastrophic effect, there were other roughly contemporaneous events that might have been as much or more responsible for the end of most life. Two things consistently appear in the geologic record at the same time that fossils disappear from it. Those two things have different indicators, but similar causes. One cause is massive activity from volcanoes. The other cause is dramatic climate change. Living in an era where climate change is an existential threat, reading that massive climate change contributed to several (if not all) of the previous mass extinctions is disturbing. The good news, such as it is, is that the climate change shown in the fossil record is often greater than the climate change we see today. The bad news is that it is not always greater, nor is it always dramatically greater. Anthropogenic climate change may not usher in the next great extinction event, but it has enough similarities to those previous events to concern us all. Furthermore, we are not “just” changing the climate. Our plastics are fouling the ocean, our pollution is changing the very air we breathe, and our homes and appetites are destroying species and habitats at alarming rates. But although our methods have changed, our impact on the world is a time-honored one. One chapter is titled, “The End-Pleistocene Mass Extinction.” This dates back several thousand years, tracing a line of destruction around the world affecting primarily (though hardly exclusively) mega fauna. Giant kangaroos and moas, American rhinos and lions and sabre-toothed tigers and mammoths and mastodons, European elephants and aurochs and even Neanderthals. Cause and effect cannot be conclusively determined, but it seems unlikely to be a coincidence that the extinction of all of these species followed the introduction of a new, invasive species that has spread around the world. That species is us. The Ends of the World is a powerful, well-written and deeply researched book. It is dark, though there are light-hearted moments throughout as Brennan interacts with scientists and amateur paleontologists around the world. Despite the planet’s best efforts to rid itself, the good news (as Jurassic Park character Dr. Ian Malcolm might say) is that “life will find a way.” That may not be good news for us, though. The dinosaurs ruled the world for millions of years. Then, one day, they were just gone (well, except for the birds). Someday our story may also be told only in fossils and strange remnants left in rocks of a bipedal primate that spread around the planet, only to fail to adapt when the planet changed around them. The question is: are we the agents of that very change?